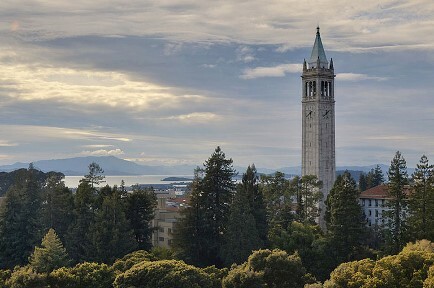 The University of California, Berkeley’s iconic Sather Tower, known as the Campanile, turns 100 years old in 2015, and its genesis, construction, and operation are being commemorated throughout the year. The #campanile100 website joyously describes how the idea for this over 300-foot tall bell- and clock-tower (the third tallest in the world) came into being and who was involved in its development. A timeline tells about people and events, such as donor Jane Sather, who died before construction of the Campanile had begun; architect John Galen Howard; paleontologist John C. Merriam, who brought excavated fossils from the La Brea tar pits to be housed in the tower; and how World War I delayed the arrival of the first bells. Celebration events have included Natural Frequencies, a light show projected on the Campanile accompanied by the sounds of synthetic bells playing alongside live carillon music activated by live data from a seismometer inside the nearby Hayward Fault, and a Bandaloop performance, during which dancers performed using the Campanile’s exterior walls as a stage. While you can’t dance on the Campanile, you can visit the observation deck to get panoramic views of the surrounding area, including out to the Golden Gate Bridge (west), downtown Oakland (south), and Strawberry Canyon (east – see if you can spot the Cyclotron), and listen to the noon-time carillon concerts from almost anywhere on campus. Commemorative Campanile t-shirts and memorabilia are available at the Cal Student Store or online.